Not only does climate change affect the people’s livelihoods but it also seriously threatens energy security. What is the solution to the problem of ensuring energy security without harming the environment? Natural disasters triggered by climate change killed 520,000 people worldwide in 1996-2016, and led to economic losses of US$3.16 trillion, as per statistics from the World Meteorological Organization (WMO). In Vietnam, climate change, or extreme weather phenomena in particular, is no longer a fancy story, but it is directly affecting livelihood, health and accommodation of millions of people. Many reports have named Vietnam as one of the five nations hardest hit by climate change globally. Under the impact of the change in the statistical distribution of weather patterns, storms, floods, flash floods, landslides, flooding, droughts, saltwater intrusion and other natural disasters have inflicted severe damage to people and property in the past 15 years, with 10,711 people listed as dead or missing, and property losses estimated at US$1.9 billion per year, accounting for some 1.5% of GDP. In 2018, a great frequency of disasters, and intense heat that hit a record high in the past 60 years befell on a large scale, leaving thousands of people in the shortage of drinking water and food. According to Vietnam’s climate change scenarios, 40% of the Mekong Delta, 11% of the Red River Delta and 3% of other coastal areas will have been submerged by the end of the 21st century. Then, 10-12% of the population will directly suffer the blow, costing 10% of GDP. For HCMC, it is forecast that 20% of the area will be inundated. Therefore, a lack of a solution to effectively respond to such a challenge may mean Vietnam’s socio-economic development would be downscaled. The increasingly unpredictable negative effects of climate change will worsen resources overexploitation and environmental degradation, stressed Nguyen Van Binh, chairman of the Party Central Committee’s Economic Commission. This is one of the risks that slow down socio-economic development and cancel out many achievements, Binh said in his speech delivered at a seminar entitled “Actively Responding to Climate Change - Strengthening Energy Security to Ensure Sustainable Development,” held as part of the Vietnam Economic Forum 2019 by the Central Economic Commission on January 17. Moreover, other experts at the seminar also contended that national energy security is under the double impact of “supply” and “climate change.” First, energy shortage in the near future is to be huge as the total power supply is currently only 47,000 MW, generating 190 billion kWh of electricity annually. Meanwhile, according to the power master plan for 2030, Vietnam will need nearly 130,000 MW of electricity, or 2.7 times the current level, with a total output of 570 billion kWh. Climate change in Vietnam will further deepen the dependence on energy. The instability of energy supplies, particularly the supply of primary energy (oil, natural gas and coal), due to the impact of climate change will badly affect national energy security. However, in the opposite direction, the development of traditional energy sources is an important reason for a more severe greenhouse effect, the direct cause of climate change. “Therefore, it is essential to study and evaluate this double impact to proactively prevent climate change and provide solutions to strengthen national energy security, ensuring sustainable development,” Binh said. In his speech at the seminar, John Kerry, former U.S. Secretary of State, said climate change always had a close relationship with the energy industry. With a relatively high energy growth rate, Vietnam needs to consider and implement effective solutions to actively respond to climate change. Currently, many countries around the world have gradually switched from traditional energy sources to new and renewable energy. This is a general trend to solve the problem of sustainable energy development, minimizing the negative effects of climate change. 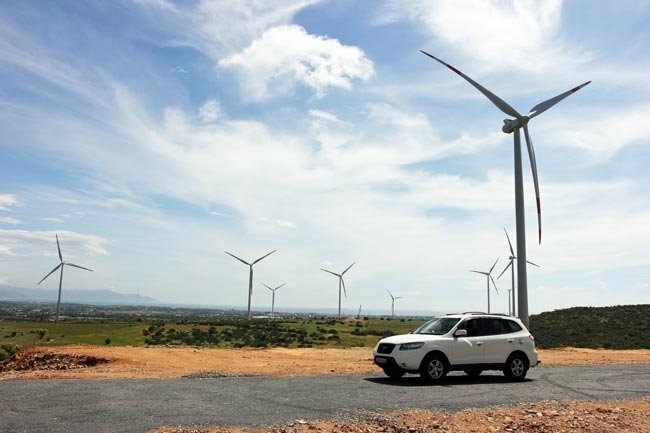 In fact, to promote renewable energy, the Government has set a target of expanding the total wind power capacity to 800 MW by 2020, 2,000 MW by 2025, and 6,000 MW by 2030. Furthermore, Vietnam aims to develop about 850 MW of solar power by 2020, and some 4,000 MW by 2025. Even so, the rate of this renewable energy source is still low compared to the total electricity output of Vietnam. Cao Duc Phat, standing deputy head of the Party Central Committee’s Economic Commission, said the use of eco-friendly and renewable energy sources currently faced some limitations in price, market, infrastructure and technical conditions. Therefore, it is necessary to formulate mechanisms and policies powerful and adequate enough to overcome difficulties and facilitate enterprises to invest in renewable energy. Some recent reports reveal the results of foreign investment in the development of power sources in Vietnam remain unsatisfactory. One of the main reasons, according to Phat, is that the current purchase price of electricity is still low, not actually following the market mechanism, and not attractive to investors, especially those from abroad. Therefore, Vietnam needs to consider and make timely decisions on this issue. In addition to developing renewable energy sources, a representative from the Ministry of Science and Technology underscored one of the important solutions to ensure energy security in the context of climate change should be to step up research and promote the application of science and technology to enhance the conservation and efficient use of energy. Even with traditional energy sources such as coal power, the current technological advances make it possible to improve energy efficiency and minimize emissions to the environment. The Manjung 4 power plant (with a capacity of 1,000MW), built by Malaysia’s Tenaga Nasional Berhad Electric Company (TNB) using technology of General Electric (GE), is a good example. This plant can produce electricity with emissions up to 10% lower than the average volume from coal-fired power plants worldwide. Dealing with climate change issues from an energy perspective with solutions such as diversifying supply, developing green energy sources, applying new technologies for efficient energy use, and minimizing environmental impacts is the direction to be taken in the future, according to experts.